SAN FRANCISCO (AP) — Sgt. Casey Day was skeptical. The chief of his rural Northern California police department wanted him to find out if an ancient martial arts weapon made famous in 1970s Bruce Lee movies could be used to subdue unruly suspects. But it only took a few days of training with nunchucks to win over Day. The weapon — two solid sticks of plastic attached by a foot-long nylon cord — was recently added to the Anderson Police Department's arsenal. The department of 20 sworn officers about 200 miles north of San Francisco joined several other U.S. law enforcement agencies that use nunchucks as "less than lethal" weapons 20 years after their popularity peaked. Day says the weapons have the impact of traditional night sticks but also allow trained officers to quickly bind wrists or ankles to control a suspect without violence. "It's a two-for-one weapon," Day said, adding that it's also easier to carry than a long night stick. 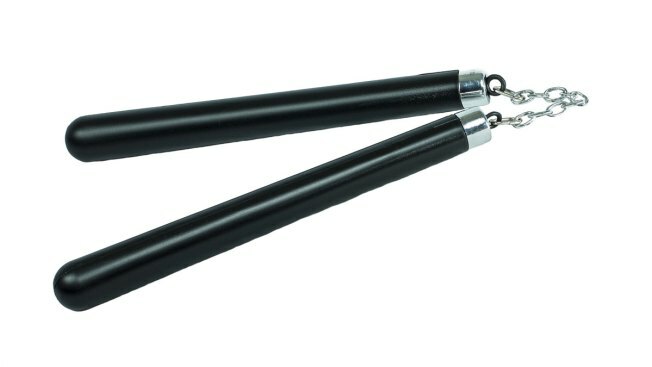 Law enforcement agencies were moving to adopt nunchucks in the 1980s, including police departments in San Diego and Los Angeles that used them to help break up chaotic protests at abortion clinics. But the weapons started to fall out of favor after the LAPD agreed in 1991 to stop using them during abortion protests to settle a lawsuit. Three years later, the 9th U.S. Circuit Court of Appeals dismissed a similar lawsuit by San Diego abortion protesters, but departments were beginning to embrace high-technology, nonlethal gadgets by then — or returned to the trusty police baton — to control crowds and suspects without using guns. Sales slumped significantly once departments began buying Tasers in the late 1990s and early 2000s, according to Kevin Orcutt, who says he's the only nunchucks maker for U.S. law enforcement agencies. "The Taser slowed everything down," he said. He provides three days of training and certifies officers as instructors to teach others in their agencies how to use nunchucks. Orcutt said he hopes to spark renewed interest in the weapon now that he is retired from a 35-year law enforcement career and is devoted full time to his Denver-based company. He said Bruce Lee movies from the 1970s stirred his interest in nunchucks, leading him to train in the martial art of Jukado and earn a black belt. He got a patent for his version of the ancient Japanese weapon in 1984 and persuaded the chief of Colorado's Thornton Police Department, where he served, to formally adopt it. Denver police nearby soon added the weapon to its nonlethal roster, and officers there still use nunchucks. A spokesman for the agency didn't return a call seeking comment. Orcutt estimates about 100 departments across the country have an officer certified to train others to use nunchucks, but he is not sure how many officers carry the weapon these days. He says he hasn't sold many of them in recent years but is hoping to branch out beyond police departments to prisons and airline security. "There is still a place for them," Orcutt said.